One often requested feature that is missing in older versions of Outlook is ability to insert a date and time stamp into the body of Outlook items. Beginning with Outlook 2007, Word's insert Date & Time button was added to Outlook's Insert tab; older versions will need to a custom form or an add-in to insert the date stamp. One complaint about the Insert Date & Time command is that it is too many steps. It's not bad if you use the keyboard shortcuts: Alt+N, D, Enter will insert the date and time format you have set as default. To insert other formats, use the arrow keys to select them, then press Enter. (Home or Page Up jumps to the top entry on the list while End or Page Down jumps to the bottom.) If that is still too many steps, you can use a macro to insert the date and time. See the Tools section below for add-ins that you can use instead. Note that the custom forms method doesn't work well with Appointment forms since you can't change the first page of the form. 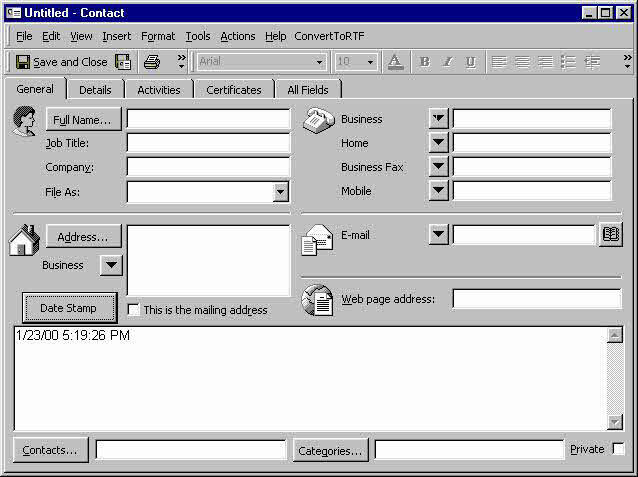 It also doesn't work well with contacts in Outlook 2003 and 2007 since editing the first page of the form reverts the form to the older Outlook contact form (as in the screenshot below). In Outlook 2007 and up, first show the Developer ribbon (File or Office icon, Options), then from the Developer ribbon, choose Design this form. The View Code button is in the Form section. After entering the code, close the code window. Open the Control toolbox and drag a command button to the form. Rename it by right clicking on it and selecting Properties. In the Caption field, type in the desired name. To use, click the button you created. If you want the date stamped in the Notes field every time you open an item, you can create a custom form as described above, but use the code below instead. You also won't need to add a button to the form, so it will work with contacts. Although today's date is added to the Notes field every time you open a contact, it's not saved until you Save the contact. In Outlook 2003 and older, or Outlook 2007's main window, go to Tools menu, Forms, Design this form. Then from the View menu, choose View code. Publish the form and set it as the default form for the folder, if desired. If you want to use it with existing items you'll need to convert the items to use the new form. Instructions are at How to Set a Custom Form as the Default for a Folder. Used to change the message class of Outlook items,so that existing items will use newly created forms.Free. How can I add/appropriately name my custom fields to the exported CSV files. I dont see the new fields but do see "user fields"
I have used the custom form methods for years without any problems until recently. Now the button has stopped working and every time I open a contact, the previous note's date. Any thoughts? there is a reg key you can set to enable scripts (it's in that article). This has been haunting me all week and your fix worked, Thank You! Dear Diane, I am trying to use Your method with a customized Task Form. When You use DateStamp for the second time You lose all the formatting of the previous text. I tried using Item.HTMLBody option, but it doesn't work. Try using rtfbody (it errored for me in outlook 2016) - if it fails in your version too, then you'd need to use word code, which will not work in script within the form. This is only practical if you need it on one computer as you need the vba on all computers - the code samples at https://www.slipstick.com/developer/code-samples/create-task-selected-text/ us this technique to save messages to tasks - you'd use similar code. I recently was promoted and now I have switch platforms(not by choice). In Windows this was a fairly simple function that I used quite frequently. In OFM 2011, not so much. All I want to do is simply add a date and time stamp to an Outlook/Calendar item. Can anyone point me in the right direction? Is there an applescript that allows one to perform this function? Any feedback will be greatly appreciated. Just because you can't include those fields in an export doesn't mean the programs can't see the date. Some sync utilities set an internal property on the it to help manage the sync. If you are trying to keep in sync using "sneaker net", a macro that checks the dates would be better than using export. (Or just copy the pst back and forth). The easiest way to keep outlook in sync is using an exchange account (outlook.com is now on exchange server). The second easiest is using icloud or iTunes - which of course, requires apple devices. Companion link works good too. I created additional fields in Outlook using the Developer tool but this new format applies only to the new contacts created. Is there a way to apply this new format to existing contacts? Thank you in advance. I applied the custom above for auto date/time stamp to my office 365 desktop and it works in notes only when I add a new contact and only for the first time...then does not work any longer. Is there a way for automatic date/time stamp everytime I add notes to a contacts record? I have a message template with a table in the body. is there a way of inserting the Datestamp in a specific cell? To the best of my knowledge, no, you can't insert it into a specific cell using VBSCript.